Leica has announced a new compact camera. The camera is called Leica V-LUX 20 and seems to be a rebranded version of the Panasonic Lumix DMC-ZS7 digital camera, but the Leica comes with a higher price tag. The Leica V-LUX 20 comes with 12 megapixels and 12x optical zoom. 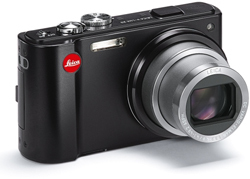 The Leica V-LUX 20 digital camera will be available in April 2010 and cost about £495. 20 April 2010: Leica Camera AG has announced the LEICA V-LUX 20, a 12.1 effective megapixel digital compact camera with a powerful 12x optical zoom lens and built-in GPS tagging*, making it ideal for recording special memories when travelling – wherever you are in the world. The integrated, high-performance LEICA DC-VARIO-ELMAR 4.1-49.2mm f/3.3-4.9 ASPH. zoom lens with a focal range of 25-300mm (35mm equivalent) means the V-Lux 20 is perfect for any photographic situation. Whether shooting expansive landscapes, detailed close-ups or shots of distant subjects using the super-telephoto setting, the V-Lux 20 captures them all in breath-taking quality. The V-Lux 20 is the first Leica camera to feature GPS tagging. For anyone travelling regularly – whether on exotic safaris, family beach holidays or even those important business trips – this innovative feature allows photographers to record the exact geographical co-ordinates of their location (in the Exif data of each photo) automatically, as well as the local time for every shot, ensuring the user always has a useful and accurate record of their trip. In addition, the V-Lux 20 can display the names of interesting sightseeing locations from a total of 500,000 ‘points of interest’ across 73 countries. For those who want to make movies as well as still images, the LEICA V-LUX 20 enables movie recording in HD quality. Its intelligent automatic features, such as face recognition, automatic scene modes and smart exposure, are all available in movie mode, together with the camera’s zoom functions. The V-Lux 20’s generous three inch LCD display has a diagonal of 7.5cm and a resolution of 460,000 pixels, and offers an extremely bright, sharp view for precise composition and framing of shots, as well as accurate quality control for captured shots in playback mode. Beautifully styled in a matt black finish, the V-Lux 20 has been designed with simple, ergonomic controls and user-friendly menus, and offers fully automatic functions for those who prefer to ‘point and shoot’. It also provides a complete range of manual shutter speed and aperture settings for more creative freedom and image control. In addition, the integrated image stabilisation assists the photographer by reducing the chance of blurred pictures, whether due to camera shake or difficult lighting conditions. The compact dimensions and light weight of the camera also make it easy to pack into a bag or rucksack, or simply carry in a pocket, so users can ensure the LEICA V-LUX 20 is with them on every trip. The LEICA V-LUX 20 includes Adobe Photoshop Elements 8 for quick and easy image editing. A high quality brown leather case for the camera is available as an optional accessory from authorised Leica dealers. The LEICA V-LUX 20 will be available in the UK from May 2010 from authorised Leica dealers including the Leica Store Mayfair: http://www.leica-storemayfair.co.uk, tel: 020 7629 1351. A full list of authorised Leica dealers is available at http://www.leica-camera.co.uk. The suggested retail price of the LEICA V-LUX 20 is £495. The optional brown leather case has an SRP of £70. * GPS tagging may not function in China and neighbouring regions. Strength of satellite signal reception depends on location, and when restricted, positioning data may be recorded inaccurately or not at all.